Borla Performance Industries has designed a great total performance Cat-Back™ system for the 2004-2014 Nissan Titan V8 5.6L engine package (Part #140079). This system fits both the short bed crew cab and extended cab. BORLA R&D Engineers have designed this dual exhaust system as a true bolt-on for either 2 or 4 wheel drive, automatic or manual transmission models. Once again, BORLA technology produces a sound resembling a polite growl indicative of an old school big block while being tame enough for a cross country run. Weighs the same as the factory single system and flows 135cfm greater. 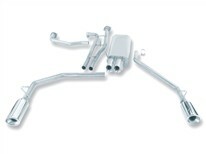 This flow improvement accounts for the double digit horsepower increase and even greater potential if the engine is modified with induction upgrades because all BORLA exhaust is tuned to maximize the output of any aftermarket performance upgrade. Nissan has developed a great truck as their introduction to the American full sized pick-up market, and BORLA has complimented their efforts with a serious performance exhaust.